I like reading poetry, but don’t do it enough. It’s very concentrated reading. Sometimes, hard work. Over the years, I’ve found that anthologies work best for me and I’ve picked up many of them from various Opportunity Shops. Some were school texts, complete with pencilled notes in the margins; some elegant collections suitable as gifts; there’s one book of ‘modern’ poetry that ends in the 1930’s. But I actually bought this one at the bookshop. It had such a pretty dustjacket that I couldn’t resist. It’s intended for children, but there’s an interesting and eclectic selection; for instance, some of the ‘war poems’ of Wilfrid Owen and Rupert Brooke, an excerpt from T S Eliot’s The Waste Land, ‘Refugee Blues’ by W H Auden, along with some Maya Angelou and Neil Gaiman and “All You Need is Love” by John Lennon and Paul McCartney. As I skipped through at home, I did find myself wishing that the editor had sought out a few more female poets – my rough count has only 77 out of 365. 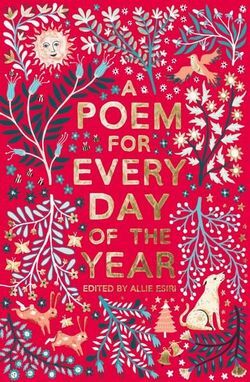 I really like the idea of one poem a day – so very achievable! – so I planned to read my poem before bed each night. However, since the editor, Allie Esiri, has chosen poems for the northern hemisphere, some of them don’t read well for this part of the world. While I panted in the February heat, it was strange to read Spellbound by Emily Bronte. And on February 6th, A Riddle by Jonathan Swift. The answer to the riddle is snow. So I thought I’d do the clever thing, and try July instead. And found Rain in Summer by Henry Wadsworth Longfellow. Longfellow (1807 -1882) was wildly popular in the United States in his day; he wrote Hiawatha and The Ride of Paul Revere and Evangeline. Though I can’t imagine his rather plodding rhymes would be read by many people today, this one was perfect. Especially since yesterday I got soaked to the skin (not that I’m complaining) and my newly clipped little dog looked most bedraggled walking home from town in wonderful, heavy, steady rain.